Hello friends! 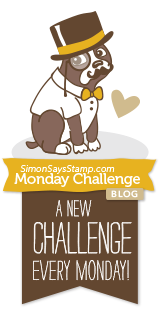 Welcome back to another Simon Says Stamp Monday Challenge. This week we are taking a Leap Into the Unknown. What a great challenge theme! 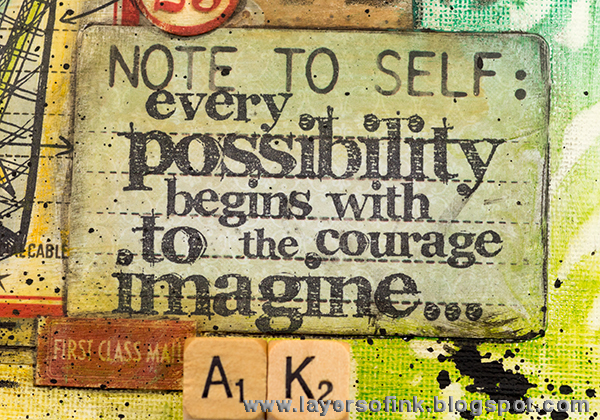 I made an 8 x 8 in canvas board about daring to imagine new possibilities. 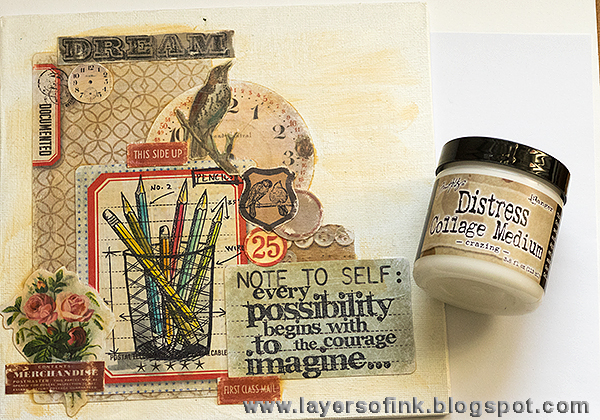 I also used my brand new Distress Crayons as well as Tim Holtz Collage Media, and had lots of fun with them. 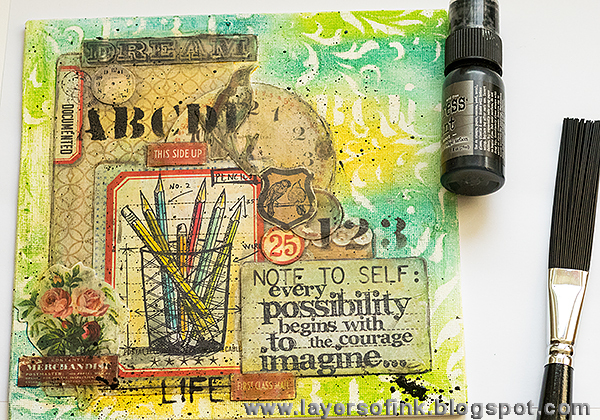 The Distress Crayons are really fun and I am looking forward to using them more and playing around with different techniques. I took some step photos. 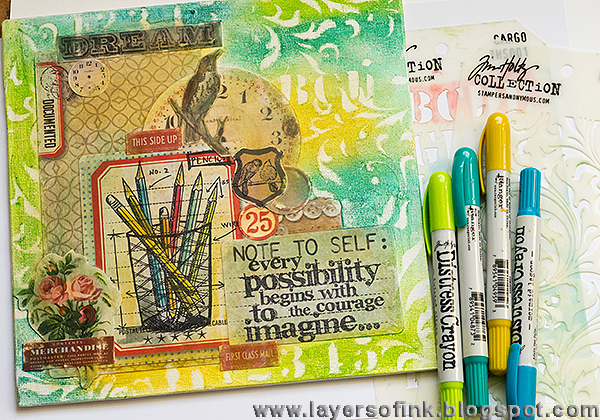 You can easily use the techniques for a card or a scrapbooking layout instead. 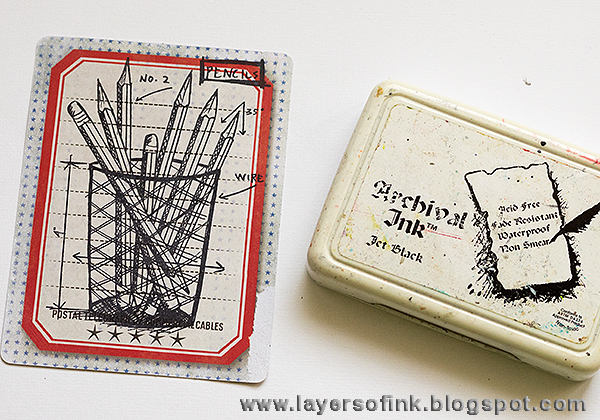 I started out by stamping the pencil Blueprint stamp on a Pocket Card. 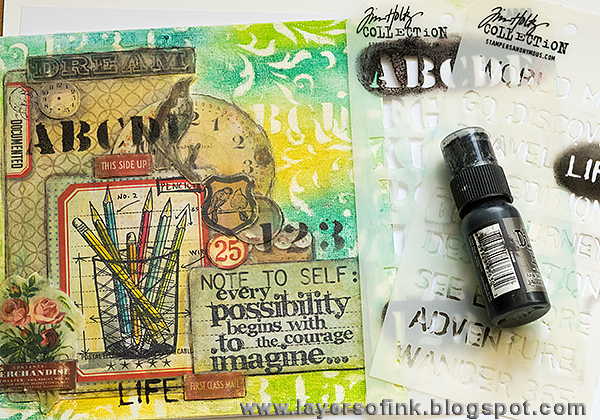 I love the design of the Pocket Cards, and you can use them for many other things than pocket projects. 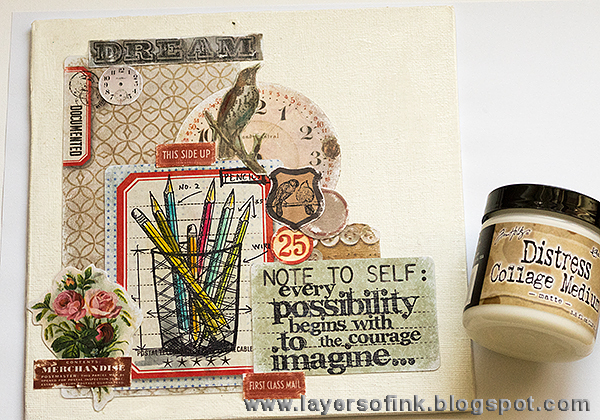 For more ideas, check out this layout and my December Daily journal. 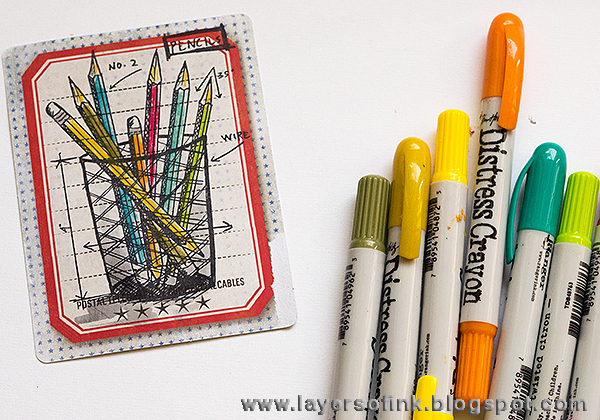 Colour the pencils with Distress Crayons. I used crayons from both Set 1 and Set 2. Use a paint brush with a little bit of water to blend them. I also added a shadow with Hickory Smoke Distress Ink. 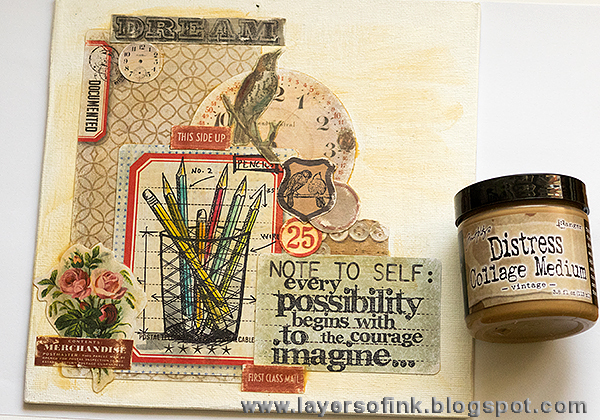 I coated the canvas with gesso and then planned out my collage. Some of the pieces were sanded beforehand. Before starting to glue things down, I took a photo of the placement, so that I knew where to place all the pieces. Glue them down with Matte Collage Medium. I really liked this medium, it is thin, made no bubbles in the papers and, importantly, dried really fast. To unify all my different pieces, I gave them a thin coat of Vintage Collage Medium. This gives a slight light brown look, you can see it more clearly over the white canvas. Let dry. Next, I added a layer of Crazing Medium on top of the paper pieces. Let dry. Now to the really fun part, and I was having so much fun that I forgot to take a step photo. 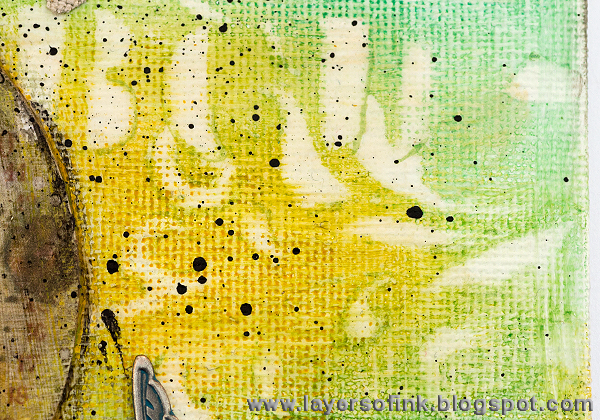 Apply Distress Crayon to the canvas, alternating the colours and blending them out with your finger. They are very creamy and blend really well. I added some to the ephemera pieces too. Place a stencil or two on top and rub through the stencil with a slightly moist cloth. This step removes the crayon. I gave the paper pieces a border with a Black Soot Distress Marker. You could also use a black Distress Crayon, but I don't have the third set yet, but I will get it soon. I also added some black Distress Paint stenciling, since I felt that the canvas needed more black. Splatter the background with Black Soot paint and a Distress Splatter brush. 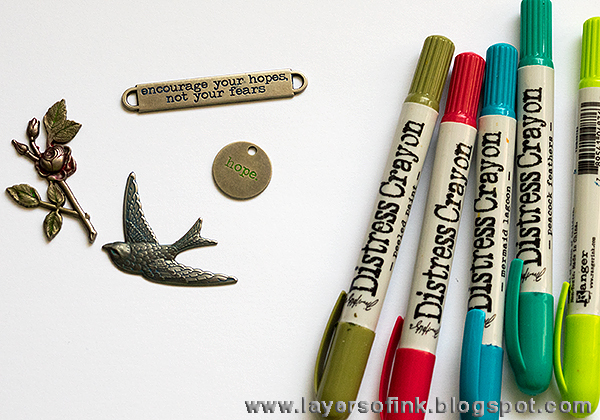 You can also use the crayons on metal, and I coloured idea-ology pieces with it. When it was dry, I painted a thin coat of Matte Collage Medium over everything, since I wanted to set the crayon. If you work fast, and don't go over the same area more than once, the crayon doesn't seem to move much in this step. To be sure, I scooped out the medium on my craft sheet, instead of taking it from the jar, so that I didn't transfer any colour to the jar. The butterflies were die cut from the new Textile Surfaces. The fabric is adhesive backed, so is is very easy to adhere to the project. Here you can see the crayon colouring on the rose a little better. If you look carefully, you can also see the subtle crackles from the Crazing Medium, especially on the flower ephemera. I love these new Watch Cameos. A clock was stamped on Dapper patterned paper, and I drew clock arms and coloured it slightly with a crayon. The effect of the epoxy sticker that comes with the cameos is very cool, but you can't quite see it on this photo. 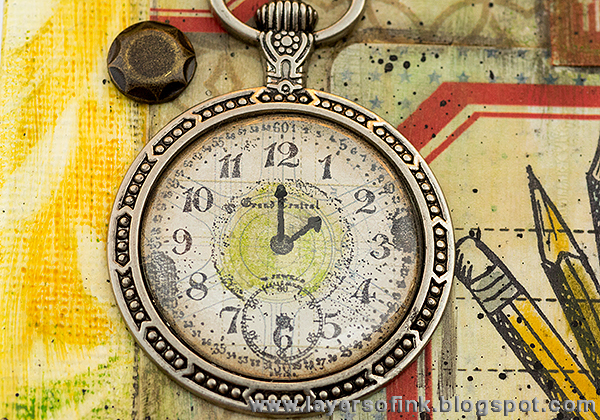 It is fun to layer pieces of ephemera. Green crayon was rubbed into the Typed Token. 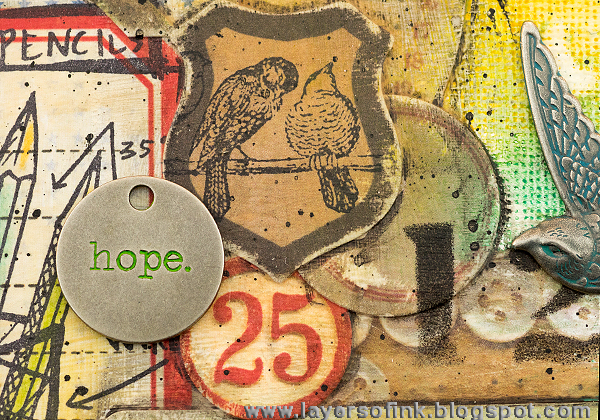 I love this sentiment stamp and it fit real well on this journaling card. The new Alpha Dice are fun. I used them to write my initials. It is easy to colour with the crayons and fun to blend them with water. 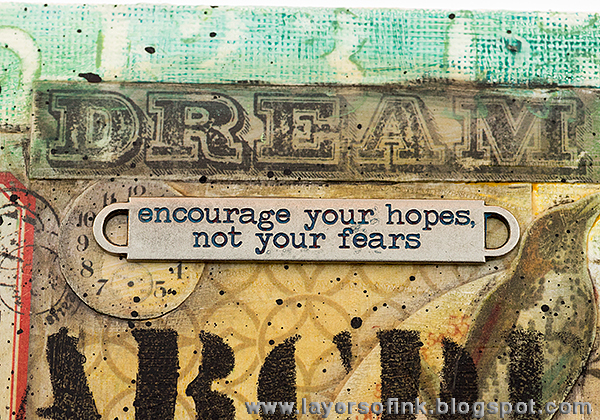 'Dream' is cut from one of the journaling cards, and I also used a favourite Word Band. I hope you will join us in our Leap into the unknown challenge. As every week, you have a chance to win a $50 gift voucher from Simon Says Stamp. You have until Monday 8am Ohio time. 1pm UK time, 2 pm CET to join in. I hope you will have a lovely week and thank you for stopping by today! Fabulous! Great collage, love the finished result!! Great tutorial, AWESOME canvas...really neat design. Anna-Karin, what a magnificent canvas!! 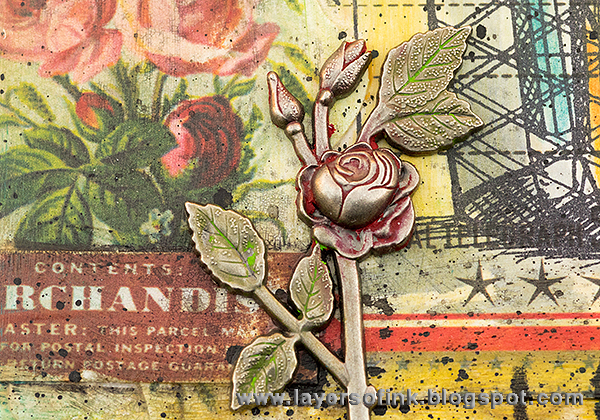 It has such a wonderful vintage appeal, and I can see why with all the different mediums you used. Thanks so much for explaining the Distress Crayons (I am still waiting for mine), I can't wait to try them out! Love the colors and fun layers! 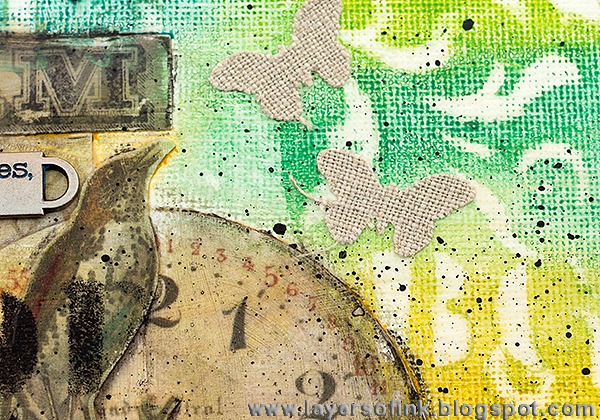 Beautiful canvas Anna-Karin ~ it has so much detail and so many gorgeous layers! I love the Distress Crayons which I've just bought and now, can't wait to use ~ they create such wonderful effects and vibrancy! Another amazing project! I definitely had to "steal" your product list and add it to my wishlist! 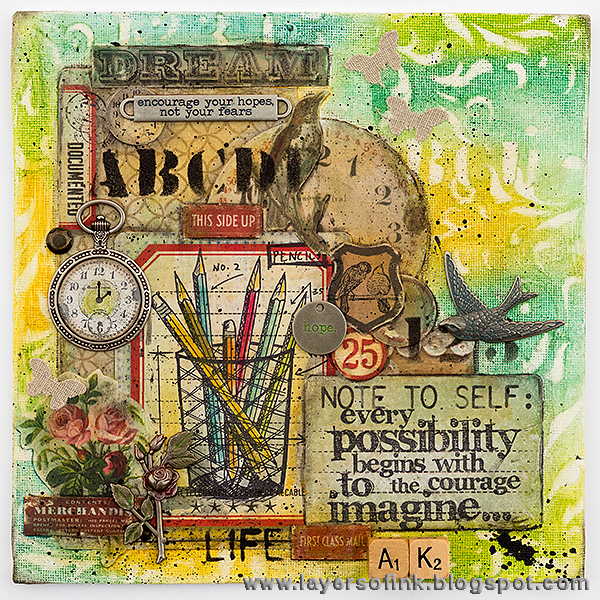 Love the way you tied everything together to create this S-T-U-N-N-I-N-G Canvas! Oh boy! 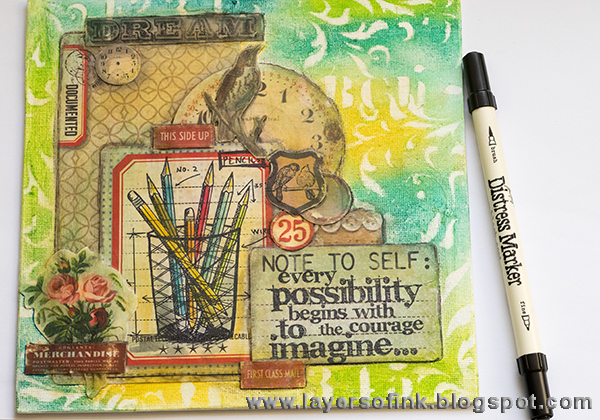 I am LOVING to see how all of you talent artists use the new Distress Crayons! I bought some and am just waiting to whip them out! But wow-- in the meantime, I'll just enjoy gawking at this genius piece. 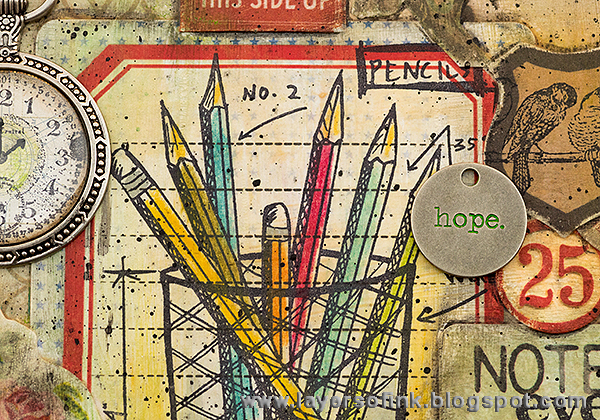 Love this-- especially the pencils! Love this canvas! I bought the TH stamps because of one of your devious posts and use it often. Thx for inspiring me. Love this project. Lots of techniques.